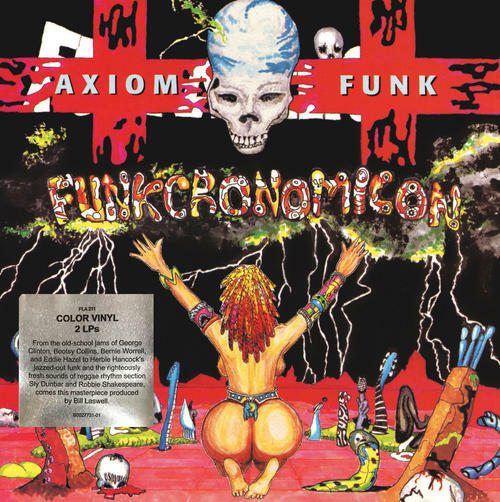 (2-LP set) Producer Bill Laswell's various artists compilation Funkcronomicon, originally released in 1995 under the name Axiom Funk, is essentially a lost Parliament-Funkadelic album. Featuring former P-Funk members George Clinton, Eddie Hazel (his final recordings), Bernie Worrell and Bootsy Collins with contributions from Herbie Hancock, Sly Dunbar, Robbie Shakespeare, Maceo Parker, Sly Stone, Buckethead and too many others to list. This is old school style (and new) funk, soul and rock colliding on an epic scale exemplified on tracks such as "Hideous Mutant Freekz", Eddie Hazel's mammoth guitar workout number "Orbitron Attack", Bootsy Collins spacey rearrangement of Hendrix's "If 6 Was 9", spoken word tracks Pray My Soul and Sacred To The Pain. For fans of Parliament - Funkadelic this is an essential, must have album. On red & cyan vinyl in a gatefold sleeve with an insert. First time ever released on vinyl!